Idea Cellular has today launched new Unlimited Postpaid Plans for its customers across India. In all circles, Idea users would get Unlimited Calls as well as 1GB data. Idea has launched a Unlimited Calling in Roaming Plan with 1GB data per day offer as well. 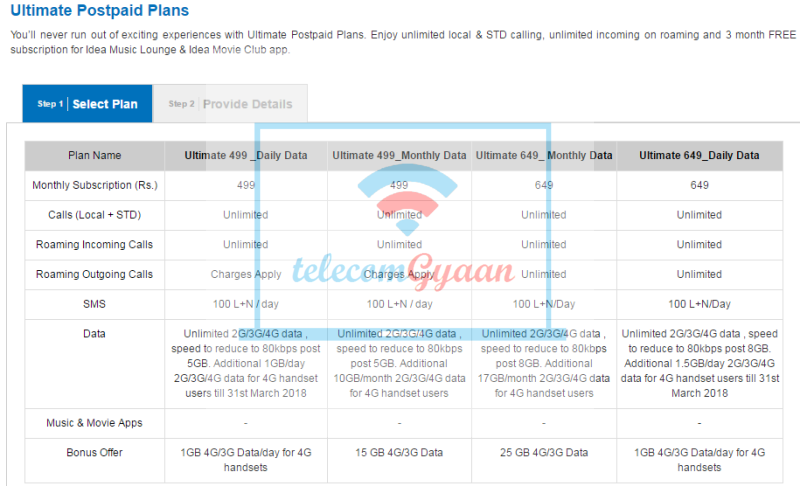 Starting with Idea Ultimate 499 Postpaid Plan, Idea is offering two options – Daily Data option and Monthly Data Option. Under Daily Data Option, a user will get 1GB data per day along with Unlimited Local & STD Calls and Unlimited Incoming Calls in Roaming. For users who does not like daily limit, Idea is offering 10 GB data per month under the Monthly Plan with Unlimited Local & STD Calls and Free incoming in Roaming as well. Additionally, a user would get 5 GB base data as well under both the options. Similarly, Idea has launched Ultimate 699 Postpaid Plan with Daily & Monthly data options. Under Daily Data Option, Idea Cellular is offering 1 GB data per day and Unlimited Local & STD calls and all Roaming Calls would also be free, both Outgoing and Incoming. Under the Monthly Option, Idea Cellular is offering offering 17 GB data per month and Unlimited Local & STD calls and all Roaming Calls would also be free, both Outgoing and Incoming. Additionally, a user would get 8 GB base data as well under both the options. For 3G circles, there is no Monthly Data option available but the Daily Data Option is available under both the plans. You can visit this page (Idea’s) and register your details if you are interested in any of the above mentioned plans.